Pure Pop Radio’s exciting Big Week of Summer Fun is now in gear, with new songs added to the playlist; a Pure Pop Radio exclusive airing of the world premiere of a great new song by this year’s premiere supergroup, Pop 4; and electric airings of the weekly Beatles roundtable, Things We Said Today, and Ken Michaels’ Every Little Thing. Plus, we’ve added a new coat of summery paint to our website. We hope you like it! Click here to see what’s been added to the playlist today, and be here this coming Thursday, July 16, for another list of new songs and artists now spinning in rotation. Tune in tomorrow night for the exclusive-to-Pure-Pop-Radio world premiere of a great song from the upcoming hall-of-fame-worthy album by this year’s top supergroup, Pop 4. And this coming Friday, July 17, be here for our look at this week’s Song of the Week from the great Timmy Sean. 1. A Pure Pop Radio Exclusive! 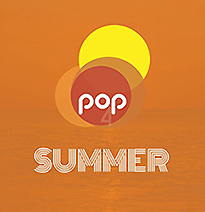 Tomorrow Night, Tuesday July 14: The World Premiere of Pop 4’s Song, “Don’t You Be Like That.” We’re honored to be able to bring to you, at 8:00 pm ET tomorrow night, an exclusive-to-Pure-Pop-Radio song from the upcoming album by Pop 4, this year’s top supergroup. Comprised of Liar’s Club’s Scott McPherson, Andrea Perry, K.C. Bowman, and Kirk Adams, the group’s debut album is fittingly called Summer; we predict this collection will be an instant favorite of pop fans around the world. “Don’t You Be Like That” is a mid-tempo, melodic charmer with satiny lead vocals from Andrea, Kirk and Scott. The lovely melody combines with joyous harmonies and deft George Harrison-esque electric guitar for a melodic pop experience that you won’t forget. Tune in tomorrow tonight at 8:00 pm ET for the exclusive world premiere of this great song. We’re proud to be spinning it for you! 2. New Songs and Artists Added to the Pure Pop Radio Playlist! We’ve added a bumper crop of new songs and artists to our playlist. New songs! New artists! New melodic pop sounds that will form part of the soundtrack to your summer! Click here to see today’s list of new nuggets, and don’t forget to check out another list coming this Thursday, July 16. 3. Brand-New Editions of Every Little Thing and Things We Said Today. Every Little Thing airs tonight, Monday, July 13 at 9 pm ET; Things We Said Today hits the airwaves tomorrow night, Tuesday, July 14, also at 9 pm ET. Both shows air on your 24-hour-a-day home for the greatest melodic pop music in the universe, Pure Pop Radio. Tonight’s third, themed segment presents reggae and ska sounds featured in various Beatles and solo Beatles tracks. You’ll hear McCartney’s “How Many People,” John Lennon’s “Borrowed Time,” and Wings’ “C Moon,” among other songs. It’s another terrific Beatleriffic set, curated by Ken. 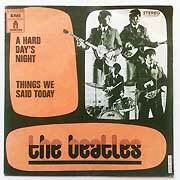 Every Little Thing is the premiere, syndicated program playing Beatles group and solo recordings. Hosted by longtime radio personality Ken Michaels, the show airs periodically on Monday nights at 9 pm ET on Pure Pop Radio. Tomorrow night’s edition of the weekly Beatles roundtable, Things We Said Today, takes a look at Paul McCartney’s recent live shows and covers an extraordinary event in the life of Rick Glover, who joins Ken Michaels, Steve Marinucci, Al Sussman and Allan Kozinn to talk about his appearance on stage at McCartney’s recent concert in Columbia, South Carolina. 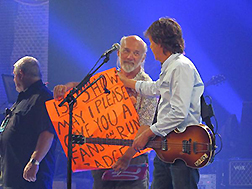 Rick Glover on stage in Columbia, South Carolina with Paul McCartney. Yeah, yeah, yeah! Glover’s tale is, at heart, a story of love for McCartney’s music. It’s a wonderful story, and Glover tells it well. You won’t want to miss this show. 4. The Latest Song of the Week from Timmy Sean. 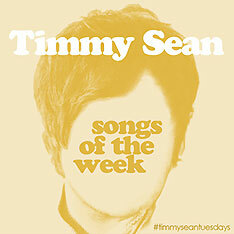 We’ve been writing about the great songs being released weekly as part of Timmy Sean’s Songs of the Week project. This week is no exception; be here this coming Friday, July 17, for our look at the latest entry. Whew! 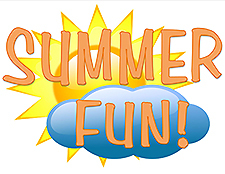 Our Big Week of Summer Fun promises to be our most exciting event of the year. Stick with us all week–enjoy the new songs and artists added to our playlist; the new editions of Every Little Thing and Things We Said Today; our exclusive, world premiere airing of Pop 4’s “Don’t You Be Like That”; and the latest Song of the Week from Timmy Sean. We’ve got five exciting days of top-flight programming for you–don’t miss a minute! Jump in the pool with us–the melodic pop is fine! 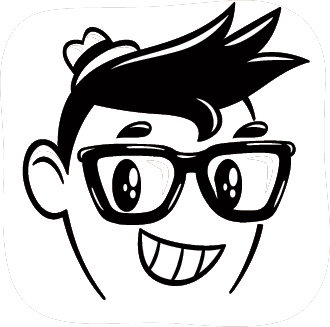 Click on the links below to listen to Pure Pop Radio, and take us on the go by downloading our mobile app for Android and iOS. This entry was posted in A Huge Year is Afoot, Ken Michaels' Every Little Thing: It's a Beatles Extravaganza!, New Songs Added to the Playlist!, Things We Said Today: Beatles Talk on Pure Pop Radio, Timmy Sean's Songs of the Week and tagged al sussman, alan haber, allan kozinn, beatles, beatles roundtable, every little thing, exclusive world premiere, george harrison, john lennon, ken michaels, new songs added to the pure pop radio playlist, paul mccartney, pop 4, pure pop radio, ringo starr, songs of the week, steve marinucci, streamlicensing, summer, things we said today, timmy sean. Bookmark the permalink. Looking for New Music? Jump On In…The Water’s Fine! 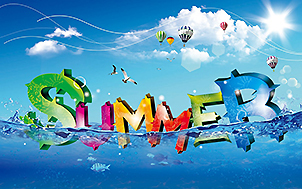 Pure Pop Radio’s Big Week of Summer Fun Is Making Melodic Waves All Over the World!